It will not be lost on anyone reading that list that as many as seven of Hill’s previous subjects played Test cricket with Bailey. 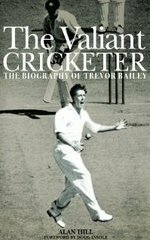 Hill has also written one of the many books on the famous Ashes series of 1954/55, a contest during which Bailey, even if his contribution is not remembered in the same way as that of Tyson and Statham, showed his usual qualities of tenacity, obduracy and reliability. In the circumstances there can be few as well versed in Bailey’s deeds and personality than Hill, and it is therefore perhaps not surprising that he has chosen to write his life story. In doing so he does create an immediate hurdle for himself, in the sense that there has already been one very good biography of “Barnacle” Bailey, by his namesake and former Essex teammate Jack, that was published in 1993. In addition seven years before that one of the best cricketing autobiographies, Wickets, Catches and the Odd Run, had appeared. That said I suspect the obstacle is not a high one. When all is said and done those titles are both long out of print, and a new generation of cricket lovers has appeared in the meantime. Hill is always a diligent biographer and he treads a well worn path here in producing a rounded chronological story of Bailey’s life concentrating, not unnaturally, on his career as a First Class cricketer, but also dealing with his childhood and youth, his activities outside the game, and his various occupations after his playing days ended. Personally I would have liked to have seen rather more about what came later than what went on before, but that is a minor quibble. I have heard it said, not without some justification, that Hill’s biographies can be unduly reverential and that they do not dwell on his subject’s flaws or failings. In fact this is not so marked in this case, partly because Bailey took some pride in his more irritating qualities, and was always happy to admit to them, thus his cussedness and occasional irascibility are fully reflected in the story. Less time is however spent on the question of whether Bailey went on too long, both in his playing career and that as summariser for BBC Radio’s Test Match Special, nor about his business ventures which, presumably, were not as successful as Bailey might have hoped. Ultimately Alan Hill’s book is just what you would expect from him, and indeed his subject. It is thorough, solid, and reliable throughout with, just to show he can do it after all, the occasional passage that flies for six, but perhaps rather more often it leaves the reader wanting just a little more. Finally a word about the production standards of The Valiant Cricketer, which can often spoil a book on any subject if they fall below what readers are entitled to expect. On the other hand there are some books, this being one, where a 3.5 star effort becomes a 4 star one. There is a good index, a thorough statistical appendix and, best of all, an excellent selection of photographs that are superbly reproduced, and perhaps the finest of which appears on a dust jacket which does great credit to whoever designed it.